The Sidekick® family of telecom testers is the perfect instrument for troubleshooting the faults responsible for over 75% of all customer service interruptions. The Sidekick® is the only troubleshooting tool that features the Stress Test to measure audible noise on a pair when "stressed" with 90dBrnC longitudinal excitation - key to identifying imbalances and series resistance opens. The Leakage Test also detects intermittent resistance faults undetectable with a typical VOM tester. 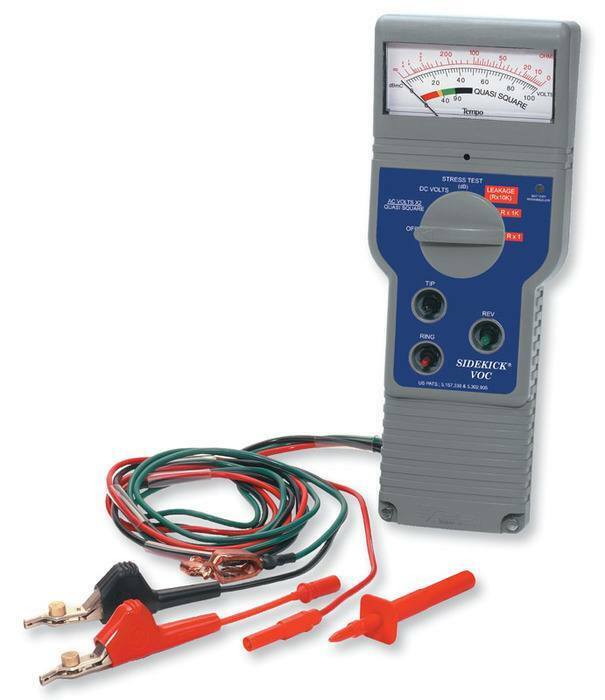 The Sidekick 7B quickly and accurately uncovers intermittent troubles other test sets can't detect. The Sidekick T&N features transmission and noise testing and is available with a traditional analog or easy to read digital display, while the Sidekick®VOC is tailored to the inside wiring found in CATV applications of VOIP. Industry leading ease of use and operation.